Jumia is really struggling. It seems the challenges of Konga are not an isolated case. People are not shopping. The Rocket Internet’s eCommerce group in Nigeria and Africa has just released its 2016 half year consolidated result showing the company recorded a net loss of EUR35.4 million within the period. When compared to its net loss recorded in last year, the company has managed to reduce its loss by 19%. 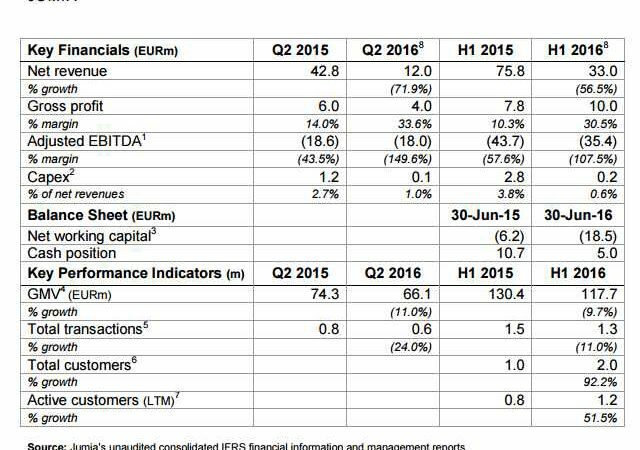 In the first half of 2015, the company recorded a net loss of EUR43.7 million. Also on the topline, Jumia’s revenue also fell by 56%. With the first half of this year, net revenue was EUR33.0 million compared to last year when it recorded EUR75.8 million f0r the first half of 2015. 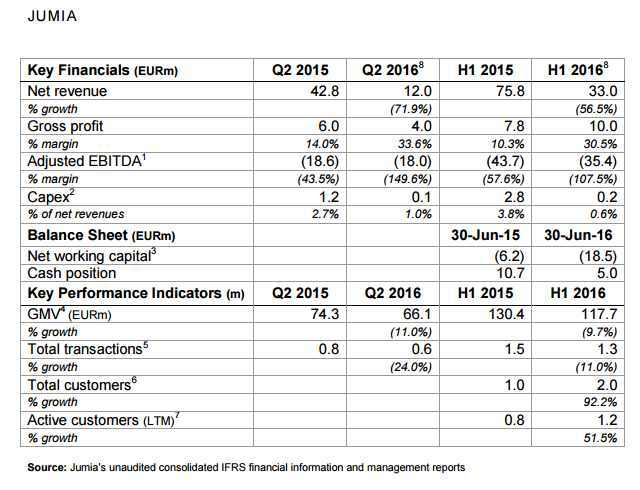 Notes: (1) Adjusted EBITDA is calculated as (i) operating profit or loss (Q2 2015: loss of EUR 20.9m; Q2 2016: profit of EUR 19.3m; H1 2015: loss of EUR 48.4m; H1 2016: loss of EUR 39.0m) plus (ii) depreciation of property, plant and equipment and amortization of intangible assets (Q2 2015: EUR 0.6m; Q2 2016: EUR 0.6m; H1 2015: EUR 0.8m; H1 2016: EUR 1.0m). Adjusted EBITDA excludes share based compensation expenses that amounted to EUR 1.7m in Q2 2015, EUR 0.7m in Q2 2016, EUR 3.9m in H1 2015 and EUR 2.6m in H1 2016. (2) Capital expenditure is calculated as (i) purchase of property, plant and equipment (Q2 2015: EUR 1.2m; Q2 2016: EUR 0.1m; H1 2015: EUR 2.8m; H1 2016: EUR 0.2m) plus (ii) acquisition of intangible assets (Q2 2015: EUR 0.003m; Q2 2016: EUR 0.001m; H1 2015: EUR 0.003m; H1 2016: EUR 0.004m). (3) Net working capital is calculated as (i) inventories (June 30, 2015: EUR 12.4m; June 30, 2016: EUR 3.1m) plus (ii) trade and other receivables (June 30, 2015: EUR 14.9m; June 30, 2016: EUR 6.0m) plus (iii) prepaid expenses (June 30, 2015: EUR 2.6m; June 30, 2016: EUR 1.3m) minus (iv) trade and other payables (June 30, 2015: EUR 36.1m; June 30, 2016: EUR 28.9m). (4) The total value of “total transactions” sold in period, including taxes, including shipping costs. (5) Total number of valid (i.e. not failed or declined) orders starting the fulfilment process less cancelled orders (before rejected and returned orders), i.e. total number of orders shipped in the period (eCommerce and marketplace). (6) Number of customers that have made at least one transaction as defined in “total transactions” at any time before end of period. (7) Number of customers having made at least one transaction as defined in “total transactions” within the last 12 months before end of period. (8) The improvement in gross margin, including decrease in net revenue and cost of goods sold respectively, is predominantly explained by a continued shift from retail sales towards a marketplace business model.